Do you know how to use social media to boost your online presence? Do your current social media profiles promote you positively and professionally? This Social Media Make-over Checklist will help you to give yourself a social media make-over! I spend a lot of time on social media. I actually love social media and all that it has to offer in terms of learning, connecting and educating others. In fact, I run two different sets of social media profiles (one for new ESL teachers and the other for teacherpreneurs. I also manage the twitter account for TESOL’s Materials Writers Interest Section and for an online program called How to Win in Challenging Times). In the past two years, I have learned a lot about the importance of using social media to grow my following. It is has been a lot of fun. Someone recently asked me to post something because she said that I was the “queen of social media”. I took that as a compliment! This checklist was actually developed for an online course in partnership with iTDi – Teacher to Teacherpreneur so I hope it is useful for you as well. Do you know how to use social media to boost your online presence? Do your current social media profiles promote you positively and professionally? 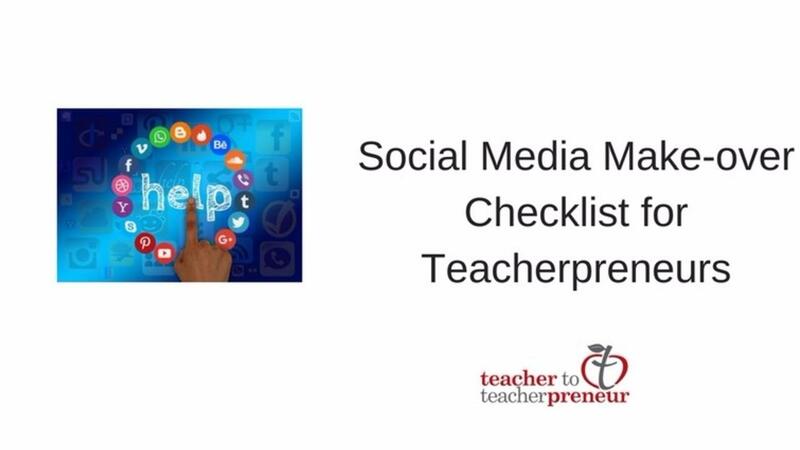 If not, then this Social Media Make-over A Checklist for Teacherpreneurs will help you give yourself a social media make-over! I spend a lot of time on social media. I actually love social media and all that it has to offer in terms of learning, connecting and educating others. In the past 3 years, I have learned a lot about the importance of using social media to grow my followers to more than 10,000K. It is has been a lot of fun. Someone recently asked me to post something because she said that I was the “queen of social media”. I took that as a compliment!